Sabina Leybold is a world traveler, risk taker and just might have the bragging rights to being more dedicated to networking than any other Philly transplant. Sabina Leybold checks out a mural in South Philly. This article is underwritten by The Somers Team and was not reviewed by the company prior to publication. Moving to Philly? Looking to buy a home? Hit 'em up. In February 2018, Sabina Leybold joined the waiting list for a PhillyCHI meetup while sitting in the Sea-Tac Airport just outside of Seattle. She was headed to a friend’s apartment in Philly, where she would crash for a few weeks and start the process of finding a house and a job. Ten hours later, she attended her first Philly tech meetup just hours after stepping off the plane. By the end of the month, the Oregon native moved into a rental in South Philly’s East Passyunk neighborhood, which she found with a roommate that she met online. And in April, she started as the Social & MarCom Coordinator at the Manayunk office of San Francisco-based agency Hero Digital. So what is it like to take the plunge, moving to a new city while still figuring out a plan? Leybold shares her experience in the latest installment of our Entrance Exam series. Technical.ly Philly: How do you sum up Philly in one word? TP: That might surprise people. SL: No it’s great, I feel like a Philadelphian already. I came here for a girls weekend during my senior year at Ithaca College, and got such a good vibe that I haven’t gotten from other places. I’m from Portland, and this really feels like the Portland of the East. After graduation I spent about seven months traveling and went to over 20 different countries, then it was time to come back and look for a job. I knew I didn’t want to move to New York City and frankly I don’t care for Boston. But [picking Philly] wasn’t a process of elimination, it was an active choice. TP: What was that meetup experience like when you first got here? "You can ask people for help when you're moving to a new city, and 99 percent of the time, they will want to help." TP: That must have caught people’s attention. SL: Absolutely. I saw someone from that meetup at another event the following week, and she said, “Oh yeah, you’re the person who just moved here.” I think it definitely made an impression. TP: How long did it take for you to start feeling settled in here? SL: I had a landing pad for a couple of weeks at my friend’s apartment. I literally sat in her bed applying for leases and jobs. I found my roommate, Miranda, through the Facebook group Affordable Housing: Philadelphia in January. It was great to have someone to share this journey with. We signed our lease for our three-bedroom house in South Philly before the end of the month, and by April I was working at Hero Digital. So everything had a pretty quick turnaround. TP: How did you jump in to the job search? SL: I actually started following Technical.ly to get to know the industry. I know a lot about the hidden job market, but I didn’t know anyone from Philly except my best friend from high school who is in a completely different industry. However, asking for help is something people don’t do enough. I used my alumni network and just asked people what or who they knew. I did a lot of informational interviews when I first got here, just getting coffee with people. You can ask people for help when you’re moving to a new city, and 99 percent of the time, they will want to help. TP: Now that you’re all moved in, what do you love about the East Passyunk neighborhood? SL: I’m really drawn to living in a row home, it definitely is a unique feature of Philly. They’re super cute, especially when they have an colorful door. There’s one particular house with a yellow door I see on my walk to Center City, and I think of it as the “bright-yellow-rain-boot door.” One flaw is that in South Philly it feels like people are just little too close to each other, such as hearing a lot of what your neighbors are doing. It’s like college. 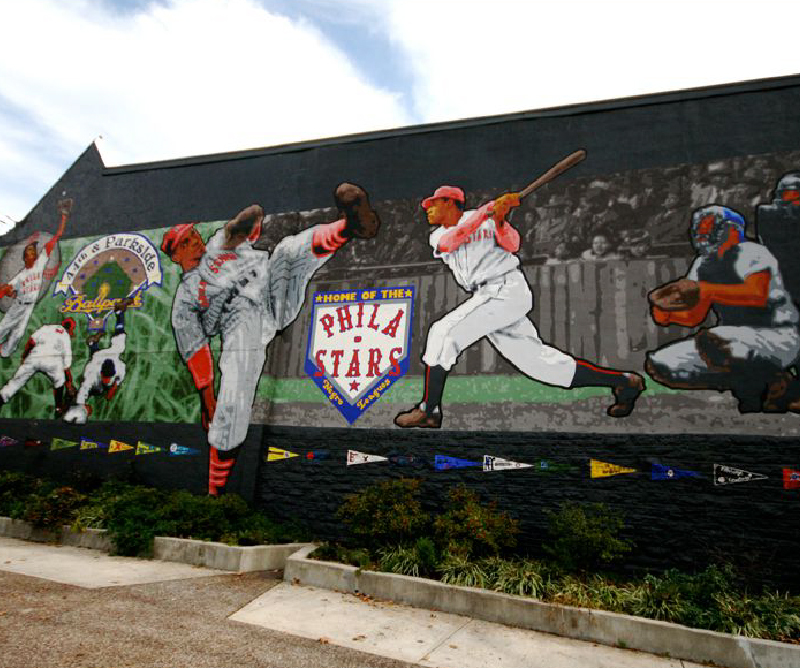 TP: What’s one place you’re really drawn to outside of South Philly or Manayunk? SL: If I ever question my decision to move here, I’ll just go back to this mural at Belmont and Parkside that really warmed my heart when I visited for the first time during college. I was very captivated by all the street art and Philly is known for its murals. I had made a wrong turn while driving back to my Airbnb in Belmont, and I saw this mural of baseball players. I remember this rush of emotion and just feeling so happy here. After I first moved here, I saw it again while sitting on the bus and had that same feeling again, and realized — that’s it! That’s the place that made me want to move here. If I hadn’t gone back to that street by accident, I wouldn’t have been able to identify that particular moment. TP: What advice do you have for recent graduates or career changers who may be holding back on taking similar risks? SL: I definitely recognize that a lot of my ability to do this comes from a position of privilege. I graduated with zero debt because my parents paid for school, and really planned ahead to save for my trip and afterwards. At one point, I heard someone say this about exercise: “It never gets easier, you only get faster.” That’s in reference to running, but I think the same is true for taking risks. It’s more likely you’ll regret not doing it than doing it.